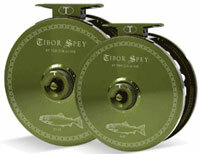 Tibor Reel Corporation reels have now been used in the setting of more than 700 world records – more than any other fly fishing reel manufacturer world-wide. Delray Beach, Florida: March 24th 2010 – With 34 new world records set in 2009, Tibor Reel Corporation has once again won the International Game Fish Association (IGFA) World Record Achievment Award for setting the most word records on their tackle in the fly reel division. This is the 6th time that Tibor Reel Corporation has won this award, and now holds more than 700 world records – more than any other fly fishing reel manufacturer world-wide. A family-owned business, Tibor (pronounced TEE-bor) Reel Corporation has been the world leader in the design and manufacture of the highest quality fly fishing reels for over 35 years. After escaping Soviet controlled Hungary and immigrating to the U.S. in 1958, master machinist, fisherman and founder, Ted “Tibor” Juracsik developed the legendary Billy Pate Fly Reel in 1970 which established new standards of quality, design, and durability for saltwater fly reels. In 1995, the internationally acclaimed line of Tibor Reels was launched, followed by the Tibor Light, the Tibor QC, and the Tibor Spey. For more information about Ted Juracsik or Tibor Reel Corporation, visit: www.tiborreel.com.